The Text of the Gospels: "First-Century Mark" - Finally! But . . .
First-century Mark is finally published! Elijah Hixson has already reported at the Evangelical Textual Criticism blog that in the latest issue of the journal Oxyrhynchus Papyri – Graeco-Roman Memoirs,#LXXXIII, Dirk Obbink – the specialist who, according to Scott Carroll, had been seen with “First-century Mark” in his possession – has, with fellow specialist Daniela Colomo, published Oxyrhynchus Papyrus 5345 – and that it contains text from Mark 1:7-9 and 1:16-18. This fits exactly the contours of “First-century Mark” which could be deduced from earlier reports about the fragment, and Daniel Wallace has confirmed that this is the manuscript that he had in mind when he mentioned the existence of a fragment of the Gospel of Mark dated to the first century back in 2012. Without actually seeing images of the fragment, there is not much that can be said about it. No doubt there will be plenty of reports about it in the next few days and weeks. The fragment is definitely from a codex, not a scroll. It should be emphasized that even if the fragment had been from the late first century, it would not have had much impact. The Gospel of Mark is generally considered to have been written in the 60s of the first century, and this would still be the most plausible composition-date whether this fragment had been from the late 100s or (as now seems much more likely) the 200s. Rather than bring some shocking new text to light, the fragment essentially confirms the text we already had. But of course I will need to read the publication before this can be shown in detail. The issue of Oxyrhynchus Papyri – Graeco-Roman Memoirs in which this fragment was published also contains information on early fragments with text from the Gospel of Luke and the Epistle of Paul to Philemon, which certainly should not be overlooked! About the picture here: this is merely a hypothetical model. The real pictures of Formerly-First-Century-Mark are not yet online (as of May 23, 2018). The real fragment is reported to have just five lines of text on each side, unlike this reconstruction. 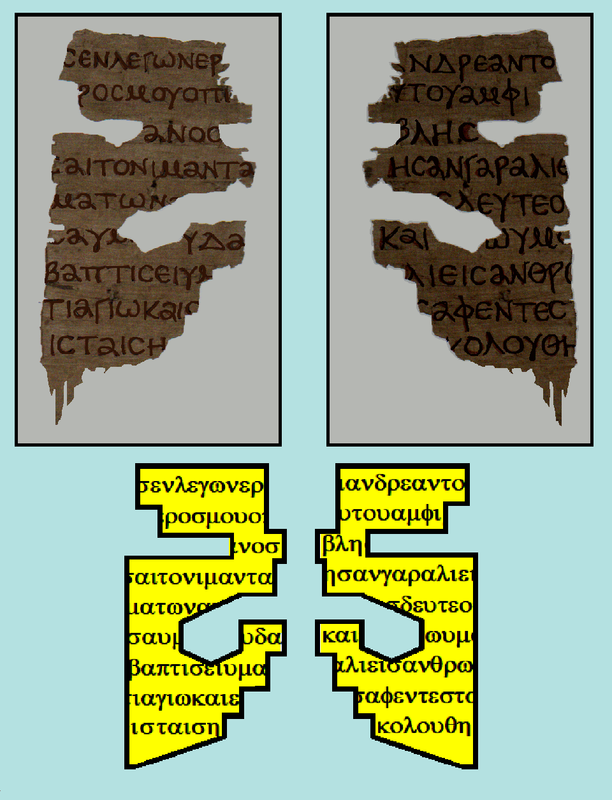 This is meant to acquaint readers with what such a fragment might look like: the front and back sides of a small fragment with text from Mark 1:7-9 and 1:16-18 is shown (above) with a presentation of its text in modern script (below). The actual age of the pictured fragment is about an hour.